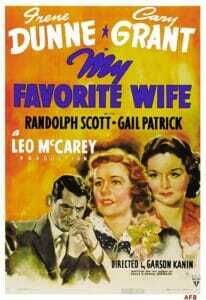 Editor Note: Gini has a couple of Old Classic films from her Turner Classic Movie Collection watching. 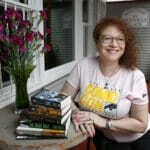 Since Atlanta is home to Turner Classic Movies it is only right that Gini should be reviewing them with her view of the world. 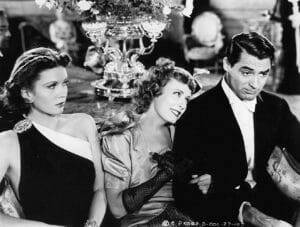 Gini is tackling a pair of what Turner Classic Movies says are classic screwball romantic comedies with 1937’s The Awful Truth and 1940’s My Favorite Wife. 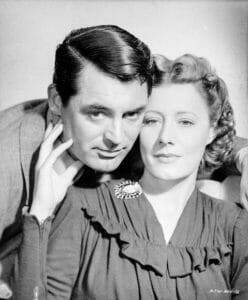 Both of these movies star Irene Dunne and Cary Grant, and Dunne gets top billing in both. 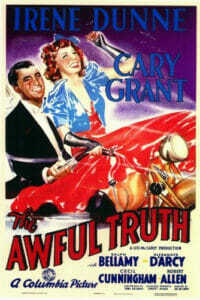 Per TCM’s Ben Mankiewicz, Grant literally became a comedic star due to The Awful Truth. But, are these movies still funny today? 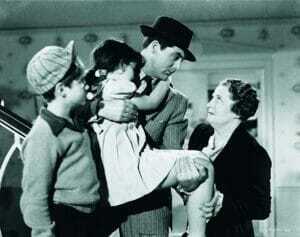 In The Awful Truth Grant and Dunne are Jerry and Lucy Warriner. Due to some misunderstandings, mostly centered around Lucy having sort of spent the night with her vocal coach, Armand Duvalle (Alexander D’Arcy), the formerly happy couple start divorce proceedings, then do their best to get in each other’s way as they pursue lives apart, Lucy with Oklahoma oilman Daniel Leeson (Ralph Bellamy) and Jerry with heiress Barbara Vance (Molly Lamont). Hilarity ensues. In My Favorite Wife, Grant and Dunne are Nick and Ellen Arden. Ellen was shipwrecked seven years prior and Nick’s finally had her declared dead so he can move on an marry his girlfriend, Bianca Bates (Gail Patrick). Ellen reappears on Nick and Bianca’s wedding day, which complicates things for Nick. Things get more complicated when Nick discovers that Ellen wasn’t alone on the deserted island she’d spent the last seven years on – Stephen Burkett (Randolph Scott) was also there with her. Hilarity ensues. Unusually, the hubs insisted we’d seen this movie before. I hadn’t. He had. Somehow. Or a movie just like it. There are movies just like My Favorite Wife, but I haven’t seen any of them and, to both of our knowledge, he hasn’t either. We’re still trying to figure out when, where, and how he watched this without me. It’s at least as big a mystery as why these films are considered great. Or funny. The hubs and I both had problems with both movies. First off, there’s the obvious problem – in both movies, all it would take to solve all these “situations” is for the characters to tell the truth to each other and have normal conversations. But the romantic comedy trope that seemingly will never die is that the characters literally cannot ever tell each other the truth straight out, nor can they ever have a normal, adult conversation. The next issue is the plot holes. Such big plot holes. In Truth, the movie starts with Jerry at his club, getting an insta-tan because he’s supposedly been in Florida for two weeks, but he has not. The implication is that he’s having an affair. But, the moment he gets home and finds that Lucy’s spent the night out with another man – under what sounds like legit innocent circumstances, Jerry is immediately ready to divorce her for unfaithfulness. But…what about his two weeks in Florida? Lucy catches him in the lie but NEVER asks him where he actually was and what he was actually doing. The subject never comes up ever again and Jerry continually insinuates that Lucy was cuckolding him. In Wife, an insurance agent visits Nick because his boss has heard that Ellen has returned from the dead, which would be insurance fraud. But even though this is a long scene, it’s never returned to. We have no idea if Nick got insurance money already, is supposed to get it, nothing. We also have the return of two people presumed dead for seven years which is greeted with literally no fanfare. How did they get back into the country without their families knowing? This move wasn’t set in the 1600’s – it was set in present day, meaning 1940, when there were plenty of newspapers and radios around. If the insurance agent’s boss knows Ellen is back, why doesn’t Nick? Frankly, why doesn’t Bianca? That’s frontpage headline stuff, especially since Steve appears to be a wealthy man. Then we have the “villains”. In reality, the villains in both movies are the main characters themselves who never, ever tell each other how they really feel, what really happened, or anything truthful. Both of them lie all the time, to each other and to everyone else. But since they’re the stars, they can’t really be the villains, right? No, instead, the love interests are the villains. In Wife, Bianca is supposedly not a nice person. We’re told this, more than once, but we never really see it. There’s a scene where Nick and Ellen’s children (who I felt were terrible actors) are making a racket – one is playing the piano and the other is declaiming a poem – where Bianca gets a headache. To indicate what a horrible stepmother she’d be. But…it’s her freaking honeymoon and her husband has been acting insane since they reached their honeymoon hotel and somehow they’re back in his house with his kids, their marriage has not been consummated, he hasn’t told the kids she’s their new mother, and, frankly, the racket was giving me a headache, too. Bianca’s reactions make sense. Hers are about the only reactions that do. Then we have Steve, who Nick views as a villain, because the guy just spent seven chaste – confirmed by both Steve and Ellen – years with Nick’s wife helping keep her alive. Steve wants to marry Ellen, but he helps her try to “win” Nick back anyway. Not a villain. In Truth, Daniel is portrayed as a dullard Lucy’s rebounded into, and Barbara is portrayed as a stuffy ice queen. Daniel’s mother and Barbara’s parents are also portrayed as nasty people when all they want to do is determine if the person their child is marrying is who and what they say they are. Considering that both Lucy and Jerry are lying about everything, the parental units aren’t wrong to want to know just what their children are getting themselves into. Both movies have a point where things look like they’ll be resolved, but suspicion against Dunne’s characters from Grant’s characters is what always keeps the movies going on. In both cases, this extension of the “situations” felt forced and fake, created merely to give the pictures a standard running time. But all of this could have been forgiven if the films were hilarious. Maybe they were back in the day, but in present time, they’re not that great. There are laugh out loud scenes in both movies, but not that many, and the chuckles are few and far between. Meaning there’s plenty of time to ask yourself about those plot holes, or to notice how easy the situations would be to fix if the characters just told the truth for once, or to note that the movie is just rehashing itself in a slightly different way. 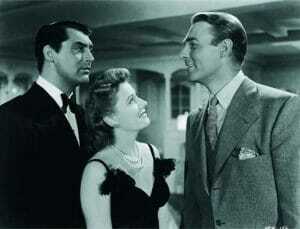 Grant and Dunne do have great chemistry together, and the costuming is lovely in both films. Most of the really funny scenes in both movies involve either Grant doing physical comedy or smaller supporting characters, many of whom definitely get the best lines and situations. Dunne is no slouch – she’s captivating and, like Grant, has great comedic timing. But the premises of both movies aren’t funny enough to sustain the humor, at least not by today’s standards. 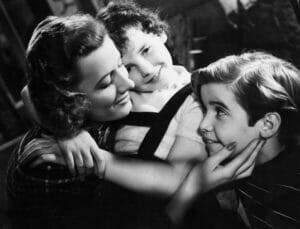 We both found Wife to be far funnier than Truth, but neither one could compare to Bringing Up Baby, Bachelor Mother, or the Bachelor and the Bobby-Soxer. The least of the Thin Man movies is still more hilarious than both of these movies put together. Neither one of us can understand how and why these movies are so beloved. 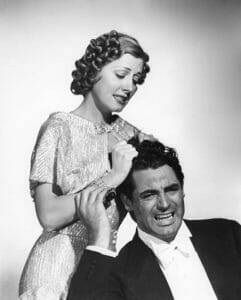 I’m glad Truth allowed Grant to blossom and show off his crack comedic timing (due to the director, Leo McCarey, relying heavily on improvisation), but in reality, The Awful Truth is that it and My Favorite Wife will never be considered favorites by me and mine.